Turkish academics are being taken to a prison in Bolu. A Turkish professor who was my father’s colleague and frequently visited our house is now incapable of counting right amount of money to pay for a bottle of water at a prison canteen. He is traumatized as a result of days of harsh treatment during the interrogation. He is sharing a prison cell with my father, longtime friends, in western Turkey. 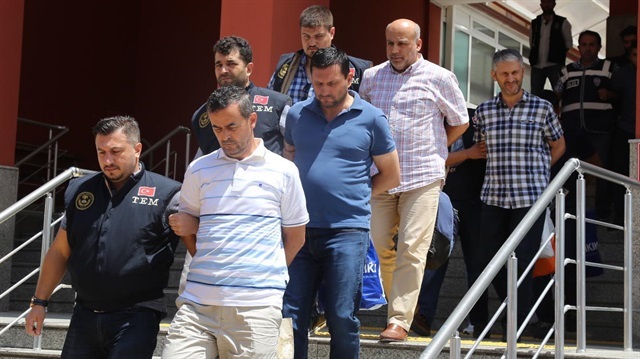 My father, a professor at Sakarya University for 16 years, is among nearly 2,500 academics who were dismissed and arrested in connection to the failed coup attempt on July 15. He would have never imagined that police would storm our house, just several days after the failed plot, and take him into custody. He was asked endless questions in 10 days under detention, for hours every day — questions that he has no answers for. He was rounded up just four days after Turkish President Recep Tayyip Erdogan signed a state of emergency rule that allows anyone to be detained up to 30 days without any charges. Turkey suspended European Convention on Human Rights and International Covenant on Civil and Political Rights and there is no due process in a country that is still seeking to become a member of the European Union. For weeks, his family and his lawyer could not meet with him. Because the investigation was confidential, he was refused to participate in his trial. How can one defend themselves if they have no idea with what they are charged with? The pro-government Turkish media had a field day when they announced that “traitor academics were locked up,” including my father. Several weeks ago, Erdogan signed another decree with draconian measures that stripped 2,436 academics of their positions and revoked their benefits. We were eventually evicted from the house we had been living for years. My father lost every title he earned in his 30-year tenure as an academic. Passports of my entire family were revoked. My family cannot travel abroad, and because I am in Brussels, I cannot travel to Turkey either. Like most Turkish citizens my father watched the awful events unfolding that night on TV. Little did he know that life would take a painful turn for him after that terrifying night. Ever since his arrest, more academics have been put behind bars from the same university, and now the numbers have reached more than thirty. Thousands more have lost their freedom and jobs all around Turkey. Another colleague of my father is now going through another drama. She was arrested on July 26 and her husband, who is also an academic at the same university, was arrested days later. Their children are left to be taken care of by their 80-year-old grandmother. I no longer see numbers in news outlets anymore. I personally know their stories and can vividly imagine what other families are going through. Because I know these life stories that are much worse than ours, and I can only be grateful even for the miserable state that my family is at. My father was recently transported from the Sakarya state prison to Bandirma state prison, which is a 4-hour car trip my family has to take every two weeks to see him. His prison cell has the capacity for seven people but 20 people are sharing it. “We are all academics in the same cell so we found a way to work it out,” he told my mother. Five in the morning, prison guards woke up my father and other inmates — professors — for a transfer to another penitentiary last month. No one knew where they were going. The families were not informed. Prison warden told my mother that the local authorities banned them from disclosing my father’s new location. “This is the kind of games they play on our minds,” my mother said. She eventually managed to find out where he was and rushed to see him before the visiting hours ended. Even if my father is set free soon, he is banned from applying for a public job again in his lifetime. Although there is no court decision on charges he is facing, the government has stripped him of all his professional affiliations. He lost his title, his salary, and my family was forced to leave the house they had inhabited for years. The government has doomed my family to absolute poverty. My father is only one of thousands of qualified, hard-working intellectuals whose lives were thrown into disarray. There is no future for them. What is more horrible amid this ordeal is the deafening silence of relatives and other colleagues. They believe their family members and relatives will be tortured in prison if they speak up. They are afraid that police will show up on their doorstep if they raise their voice against this injustice. Their fear is not without reason: Everyone is making desperate efforts to distance themselves from critics. But Turkish government has declared a full-fledged war on anyone it deems as critical. From journalists to academics, the government has not even a modicum of tolerance to an alternative academic thought. The arrested people may appear in papers as numbers, but they are first and foremost our loved ones and what they are going through is a complete nightmare.